With spring in the air, thoughts turn to camping. 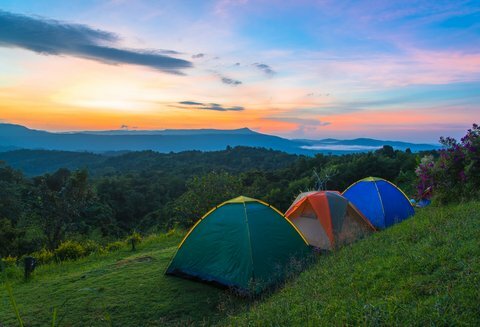 Outdoor enthusiasts are organizing their gear and getting ready for the great escape from the hustle and bustle of everyday life, eager to wander wooded paths, huddle near a campfire and enjoy nature’s wonderlands. The hiking is rugged in the White Mountain National Forest but the sights make it worth the work and the challenge. The eight walk-in campgrounds in the northern part of the state are a good choice, but White Mountain also has 24 drive-in campgrounds and a combined total of 800 available campsites. Backcountry camping is allowed and there are even log lean-tos scattered throughout the forest. One of the biggest draws in Vermont’s Green Mountain National Forest is the state’s longest trail at 270+ miles. This route follow the ridge of the Green Mountains through Vermont from the Massachusetts border to Canada. There are five developed campgrounds with accessibility varying by season. Backcountry camping is also allowed. Best of all, there are no entrance fees and many of the campsites are free as well. The Green Mountain Club maintains 70 such campsites with water sources and club caretakers may come by to charge a small fee during summer and fall seasons to help maintain them. Beaches and camping? The Assateague Island National Seashore encompasses a barrier island where you can relax and hike on 37 miles of beach, explore sandy marshes, forests and a coastal bay. Camping is allowed on the Maryland side of the island at two oceanside and four bayside camping areas. Reservations are a must and can be booked up to six months in advance. Backcountry camping is allowed but it’s only accessible by backpacking in or by water. While you’re here, look for the famous community of wild horses who call this area home, the Assateague Ponies. Olympic National Park in Washington has 16 National Park Service-operated campgrounds for a total of 910 sites, plus a lot of opportunity for backcountry camping. If you’re not a tent enthusiast, there are rustic lodges open all year. Campground fees range from $15-$22 per night and there is a $20 vehicle entrance fee. Primitive sites remain open all year. You will encounter three different ecosystems in this one park. Check out the Quinault Rainforest and see the largest Sitka spruce tree in the world. At Ruby Beach, you’ll have a view of mountains, glaciers and rainforest right from the shoreline. You might even spot whales off the coast during migration season. The 800,000-acre Joshua Tree National Park sits at the intersection of two ecosystems. To the east is the low-lying Colorado Desert and to the west is the higher and cooler Mojave Desert. It’s a popular camping destination known for excellent rock climbing opportunities with ten mountain peaks higher than 5,000 feet in elevation. There are nine established campgrounds, some requiring reservations October through May. The rest of the sites are on a first-come basis. Open year round, Badlands National Park has stunning scenery with eerie rock formations and wide expanses of prairie. The park hosts an astronomy festival every August that draws stargazers from near and far, and it’s also a popular place for those interested in fossils. The Badlands have one of the most complete fossil accumulations in North America, providing a peek at ancient ecosystems preserved in rock. There are two park campgrounds: Cedar Pass with some amenities like running water and electricity at $30 per night, and Sage Creek, a more primitive area without on-site water. Campsites at Sage Creek are free and have a bonus if you want an up-close look at the bison who frequently wander through the area. A 7-day vehicle entrance fee is $15. The Voyagers National Park has 220 free designated campsites but they are all only accessible by water and available on a first-come basis. This park is a mecca for water sports enthusiasts who pay a $10 daily fee for private boating. If you don’t have your own vessel, guided boat tours are available with reservations. Summer and spring are ideal for water activities, but there’s also plenty of good hiking. In winter, the park sees a lot of activity with snowshoers, cross-country skiers, snowmobilers and ice fishing. While there’s no charge for reservations on individual campsites, you’ll need to get your free permit from the visitor’s center. There are 13 developed campgrounds and a whopping 1,009 established sites in Glacier National Park, many on a first-come basis although some require reservations. During the summer season, campsite fees are $10-$23 per night with a week-long vehicle entrance fee of $25. Backcountry camping is also allowed with a permit. This gorgeous area features over 700 miles of trails that wind through forests, meadows and mountains making it a hiker’s paradise. Trails from Logan’s Pass offer spectacular views of alpine lakes and there’s a conveniently located campground nearby. Just 75 miles from the urban bustle of Washington, D.C., the Shenandoah National Park is a perfect nature escape with more than 500 miles of trails, magnificent views and even waterfalls and wildlife. Four campgrounds are open spring through fall, with reservations recommended. Backcountry camping is allowed with a free permit. Entrance fee is $20 per vehicle, valid for seven days and visitor’s services are usually available March through November. The toughest route in the park is the eight mile hike to Old Rag Mountain, which rewards hikers who meet the challenge with amazing views from its peak. Rafting, canoeing and kayaking are incredible on the Rio Grande River that runs right through Big Bend National Park. If staying dry is more your style, there are trails covering desert, mountain and river terrain, limestone slot canyons to explore, and gorgeous nightly views of starry skies. You can find primitive roadside backcountry camping throughout the park and the park also operates three developed campgrounds with fees at $14 per site. It’s not typical desert in Carson National Forest because temperatures are somewhat cooler so guests find a great environment for fishing, camping and hiking. The 16-mile round trip up New Mexico’s highest peak, Mount Wheeler, is challenging and rewarding. The park has 35 established camping areas scattered throughout with some appealing lakeside locations and backcountry camping also available. Laguna Larga offers four campsites right on the water’s edge, but make reservations if these popular sites are your first choice. Just north of Jackson Hole, Grand Teton National Park is home to impressive Rocky Mountain peaks, crystal clear lakes and streams, and an incredible variety of wildlife. Trails galore mean you can choose your ideal hike from easy to strenuous. Backcountry camping is free with a required permit and you may be able to register online. The 7-day vehicle entrance fee of $30 is valid here and at Yellowstone National Park. Campground fees are $22 per night per site, and there are five campgrounds within the park. Visitor services ramp up during the summer months but there is always at least one visitor center open year round.